Our Favorite Things About Spring! We can’t wait for birds to return! Spring is a prime season for bird-watching, and since they’re all getting ready for nesting season, there’s no better time of year to enjoy birdsong. Remember to clean out your bird feeders and stock up on food and water if you want to really enjoy the fruits of the season. Birds aren’t the only thing coming back to us. Bees and butterflies also make their first appearance of the year. If you want to attract more of these beautiful, beneficial insects to your yard, ask us about what local plants you’ll want to include in your outdoor space, and how best to arrange them. We offer landscaping design services to create beautiful, functional, whimsical spaces for you and your woodland guests! All that being said, our favorite thing about spring is definitely the flowers! We’re a nursery, after all. Now is the time to get your garden ready for the coming warm months, by following these tips and joining us at Whispering Springs for all the tools, supplies, and knowledge that you’ll need. 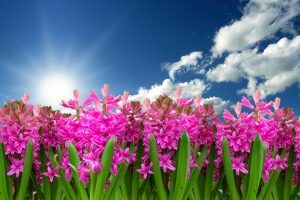 Even if you’re a little bit nervous about yard work, hot weather, or even seasonal allergies, everyone looks forward to the end of winter. Come down to Whispering Springs and let’s get ready for a great spring!